Everglades National Park is the world’s largest freshwater marsh and home to many endangered species, but that’s only the beginning. It’s not the swamp that most think of when they hear “wetlands” but a uniquely beautiful habitat consisting of “swamps” as well as lots of green land spotted with tropical hardwood hammocks. The Everglades National Park is visited by over a million people every year. This may be the only place to see some of the wildlife residents up close and personal, which is probably the reason it’s such a popular tourist destination. Walk along the slow-moving Okeechobee River and look for crocodiles, panthers, over 300 species of birds and more. It’s much more than a day at the zoo. It’s a day where you can become swallowed up by one of the world’s largest nature conservatories and lose yourself in the beauty and serenity of it all. Or you can get swallowed up by an alligator if you get too close to a hungry one. ; ) Don’t worry, just stay in the area you are told to stay and don’t venture beyond. This is not a petting zoo; keep your hands to yourself! Alligators hate being petted. You can take a paddleboat along the river if you like, but it’s going to take you 7 days. The best to see the Everglades is an air boat where you sit high above the water and have a great view while the driver covers great distances and occasionally stops the tour to show you something incredible or to point out special habitats. Some folks might like to take a power boat tour that lasts 5 hours from Wilderness Waterway. It’s one of the only ways to explore the entire river and surrounding swamplands in one day. Take a relaxing stroll through Mahogany Hammock to enjoy some of the tree and plant life up close. Take a slow canoe ride through Chokoloskee Bay and try your luck at catching a few of the tropical fish here. 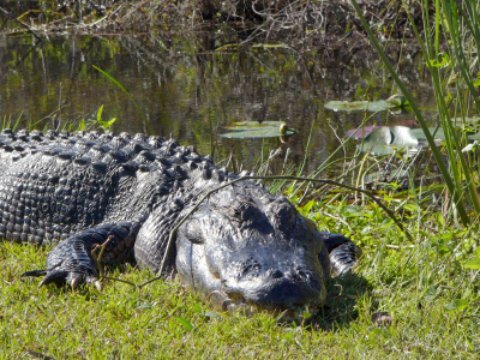 Kids of most ages: Along the Anhinga Trail, the kids will love looking for alligators and other wildlife that reside in the jungles of the Everglades. Eating: Enjoy a filling meal after a long day of exploration at Flamingo Lodge or the Miccosukee Restaurant. Sleeping: You can camp out inside the Everglades at the Flamingo Campground if you like, or cozy up inside the Everglades Spa and Lodge.